I have to confess that the reason I accepted a copy of Churchill's Tale of Tails for review was because of the main character's name. (*cough*) I was already sold. Had to give him a try. The book arrived and I was charmed as I opened the covers. Churchill is a pig who valued many things in life including smelling beautiful flowers and reading good books. He loves to have tea with his friends. But there is one thing that he prizes above all else: his tail. It might not be a big tail, or even a fancy one, but it is his and he loves it very much. One morning he wakes up to discover that his tail is missing! He searches everywhere but cannot find it. 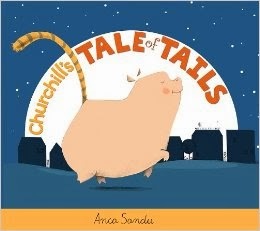 His friends decide to come to his rescue and they begin rounding up spare animal tails for Churchill to try on. Churchill tries on zebra tails and peacock tails and while he finds something to appreciate about each one, he has to discover that his tail is best for him. When he finally finds his tail he realizes that trying on other tails wasn't the right thing to do and the other tails had only managed to turn him into a silly pig. His tail is perfect for him and all's well that end's well. I accepted this book for review from Peachtree Publishers in order to participate in a blog tour highlighting this book. I have received no additional compensation for this post and all opinions are my own. If you'd care to see what another reviewer thinks of this title, check out A Word's Worth who is also participating in the tour. This does sound like a nice story.